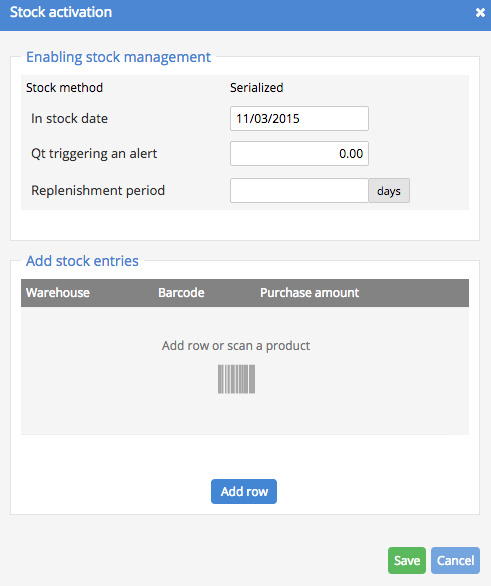 Sellsy allows you to easily manage product inventory with serial numbers. In this case, stock valuation is calculated by room and not by average cost. This is an ideal feature to ensure traceability of products sold. You must enter initial stock by entering the serial numbers of the products and their individual purchase price, all of which vary from one product to another. Other settings for products allow you to adjust the alert threshold and specify warehouses. Another note regarding activation of product details: you will find your serial numbers and barcodes on the product record. Manage your inventory (internal movements, tracking, etc.) by clicking close Manage serials. To add a serialized product to a sales document simply scan the serial number barcode.